"Action packed fantasy as if playing a video game"
Syrfan Sigmeund, a soldier serving the kingdom of Zyland is ordered to find a holy weapon by the king. Thus, he embarked his mission along with a few companions found along the way. But the demons will try to stop them by force. 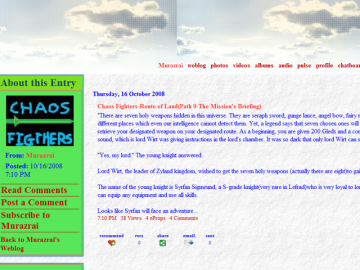 Chaos Fighters-Route of Land has not been tagged yet. Help others find Chaos Fighters-Route of Land by tagging it! Chaos Fighters-Route of Land has not been reviewed yet. Chaos Fighters-Route of Land has not been recommended yet.